Anyone who has ever pet a dog’s soft ears or felt the gentle rumble of a cat’s purr knows the calming feeling an animal can offer. A pet companion presents many health benefits to their owners, like lower cholesterol levels and can even prevent heart attack and stroke. They can also help fight depression. For these reasons, more and more, animals are being utilized for therapeutic purposes at senior facilities. Pet therapy animals are used to promote health and healing for seniors of any age range or health condition, whether they are depressed, chronically ill or have ongoing disabilities. At Seniors Helping Seniors Lakewood, we offer such services. Meet Olive! 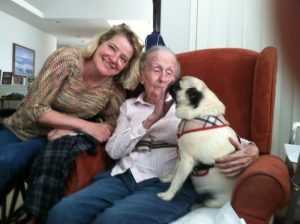 Olive has been involved in senior care nearly all her life. 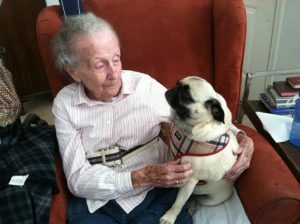 She travels to homes and assisted living facilities where she spends time with kind pet lovers who can no longer have a pet. 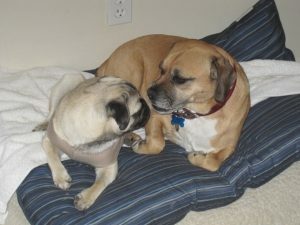 She has met the nicest people and greatly enjoys her time with her senior friends. When asked about any concerns with her career choice Olive said “the amount of treats may affect my girlish figure”. 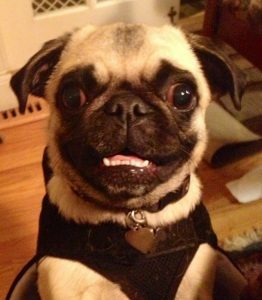 Prior to her position with SHS Olive was a retail Pug at a posh boutique called Dog Savvy in Larimer Square as well as head of security at her high-rise apartment building. She is also an honorary “helpful hardware pug” at Ace Hardware. She spends her free time hiking, playing ball or watching television with her parents, uncles and grandparents. Her favorite color is pink and her favorite food is roast chicken. She enjoys all types of music but prefers listening to her Mom play classical pieces on her cello. Want more info? Fill out the form on this page or call us today!